Landmarks for wrist arthrocentesis are palpable with the wrist in a neutral position. Noted landmarks are the radial tubercle of the distal radius, the anatomic snuff-box, the extensor pollicis longus tendon, and the common extensor tendon of the index finger ( Fig 2.78:3). 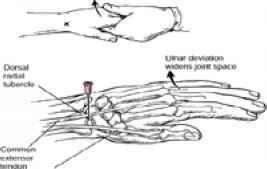 The needle should be inserted perpendicular to the skin slightly ulnar to the radial tubercle and the anatomic snuff-box between the extensor pollicis longus and the common extensor tendons. FIG. 278-3. Arthrocentesis of the wrist.